Zman and I are doing very good with our mission of stopping smoking, which is a very good thing, because I started my workout program on Tuesday and thought I might die! It was 25 minutes of cardio and I really thought I was going to cough up a lung after the workout. I can’t imagine what it would feel like if I had still been smoking. The burning in my chest, the coughing…. did not feel good. But, I will push through, I will triumph!!! See me now, pumping my fist in the air in victory. We are doing good… Sure the urges still come and go, but they aren’t as strong and there are fewer of them. This is a very good thing, it means that we are getting over the habit part of smoking. Honestly, for me, the habit is the hardest part to get over. I’ve used dum dum suckers (ironic don’t you think?) to help me get over the hand to mouth sensation. The other day I pulled up to the stop sign at the end of the road where before I always lit a cigarette. I put a dum dum sucker in my mouth, then cracked the car window so the smoke could go out! Habit. I did get a good laugh at myself. Zman on the other hand finds the nicotine and taste equally as hard as the habit part of stopping. But, he smoked full flavor menthol, and chewed the nicotine gum at work where he can’t smoke. So I get that he is having a harder time than me. Poor thing, I’m so proud of him! While I still get urges of wanting a cigarette, honestly, the actual thought of the cigarette taste in my mouth turns my stomach. YUK! This is NOT the case for the Zman. He still misses the taste. Back during Christmas time I bought several large bags of mini candy bars for the kids stocking stuffers. Now, our kids are older and do not live at home any more. But, our kids will always be our “kids” so I bought lots of candy for them. However, they politely let me know that “they really don’t eat that stuff anymore” Who knew???? So I was left with 3 very full, gallon bags of mini candy bars. I stuck them into the freezer, Uh, because I wasn’t going to waste them! This is what I found last night when I was doing the freezer inventory for the week. Um, Hello! This is what’s left of the LAST bag!!! OMG Right??? The LAST bag!!! 1. I understand why I need the fitness program now. 2. I understand that now I have another habit I’ve got to quit! DANG IT! 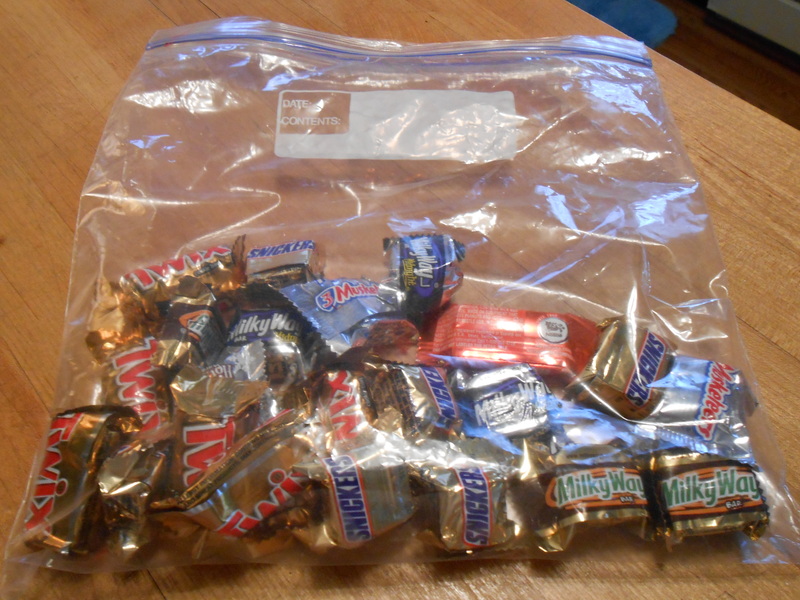 Go figure… my kids are too old for candy, yet I’ve plowed through 3 GALLON bags full. I blame them. I blame the kids!!! What??? Posted on March 6, 2014 March 6, 2014 by LoriPosted in Health and Fitness, Stopping SmokingTagged Health and Fitness, Stopping Smoking. Next Next post: Friday Fun with Lori Likes…. By the way, I’m really proud of you and the Zman. You’re doing great!